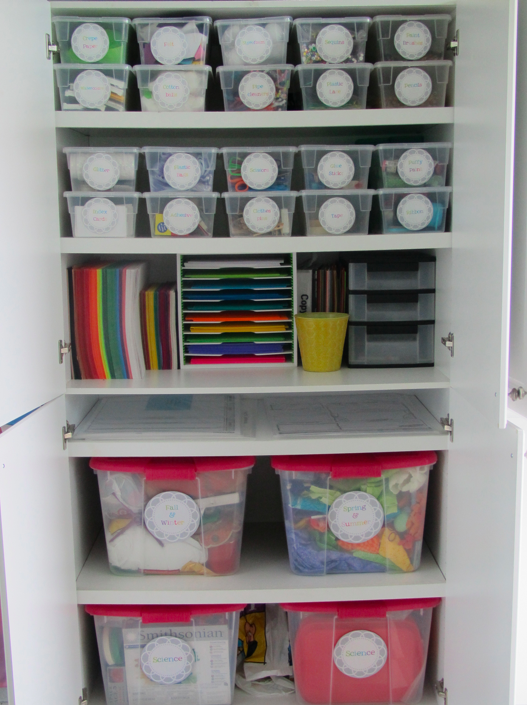 One of my huge classroom goals for this summer was to organize the storage closets in my classroom. At the beginning of last year I had so much other stuff to do that I just shoved everything into storage and closed the door, but of course as the year went by and I had to aimlessly search through the mismatched bins overflowing with miscellaneous stuff, I knew that this was definitely at the top of my list this summer! I have been in my classroom all week literally taking everything out of storage, organizing, sorting, and then putting it back in nice and pretty! Oh my goodness, it looks SO much better than before (I don’t have “before” pictures, but believe me, it was not pretty)! I am super excited that this year I will actually be able to find what I am looking for and won’t be spending a ton of money buying things I already have (but can’t find)! The first thing that I did before I even started organizing my supplies, was go out and buy a bunch of matching storage boxes. I found a great deal for a 3-pack at Lowes. I liked these boxes because they were clear so I can see what’s inside, and they have clear lids to match. 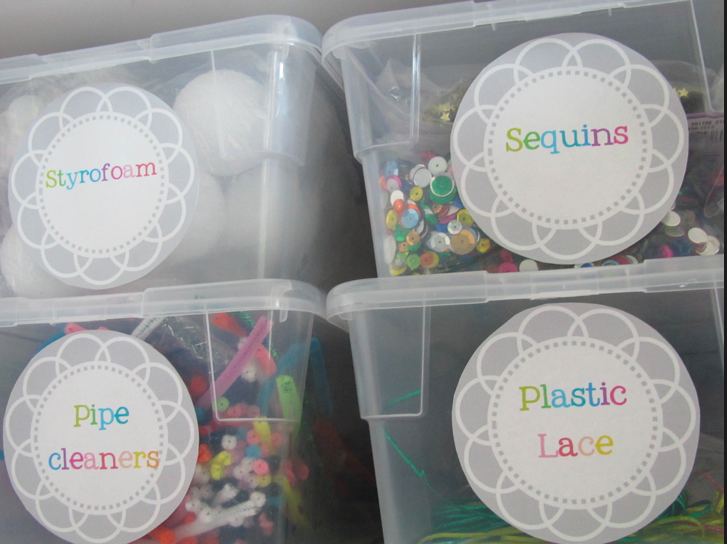 Then I made some colorful labels using these adorable grey circles from Eryn at Elementary Organization! I love how the labels turned out because they are simple and colorful! It feels so good to be getting everything organized before the start of the school year! I’m hoping to have my classroom ready by the end of next week so I can share pictures with you all! I am loving how it is turning out! 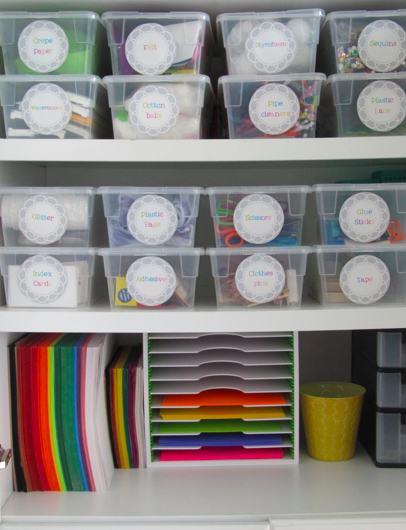 I have uploaded my labels to TPT and you can get them here if you would like to use them to organize your room as well! I will also be giving away the labels for free to the first two people who leave a comment with their email address! I love your labels. Too cute!! I would love your labels! Love your organization! I attempted this before locking up my classroom in June, but yours just looks so fab! I LOVE these labels! Especially the colors of the font! Adorable! Your closet looks GREAT! Adorable! I have two dreaded closets, so maybe if I win, I can get the motivation to organize! That is the cleanest and most organized closet I've ever seen! I LOVE those labels! I organized before school ended and felt such a weight lifted. Not to mention I actually had stuff that I was buying because I couldn't find it! Can you please come organize my closet? 😉 It looks great! Those labels are beautiful! And your closet looks amazing! Have a good start to your year. I LOVE your labels! They are perfect and I LOVE how organized your cabinets are! Wow! You are so organized! I always start to be organized, but then I get so caught up in everything that I slowly start throwing things all over the place. You just gained a new follower! I think I started drooling on myself when I saw the picture of your closet!!! Thanks for entering my giveaway. hi, where did you find the organizer you are using for your construction paper? Thanks so much!